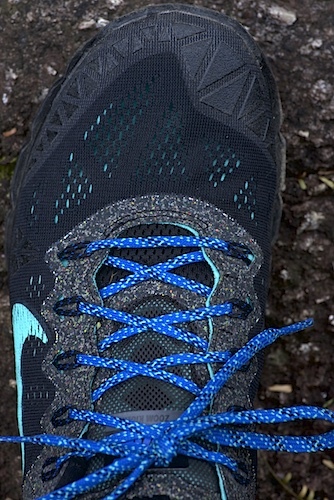 More Nike Zoom Terra Kiger v2 photos throughout the review. Previously I proclaimed the ultimate technical trail running shoes to be the New Balance Minimus MT 10OB2’s. I have a couple pair of them and I absolutely love them. That is, I did love them, until I fractured my fifth metatarsal on my right foot. Now, I need something a little less minimalistic, but still lightweight. Enter the Nike Terra Kiger v2’s. Don’t look now, but the Zoom Terra Kiger 3’s (click) are available! I was on a shopping trip for whatever I could find – running shirts, socks, shorts, and a waist pack that held water bottles. I wasn’t sure I was going to find anything, and then BAM, there they were – in grey or black. They had USA 11’s in black and I tried them on. WOW. Perfect. I bought them in spite of the steep price. $150 USD. The price of living in Thailand, quality running gear, computers, speakers, everything from overseas is expensive. I mentioned in my first article about the Kiger v2’s that I tried on the original Terra Kiger v1’s at this same store about six months ago. So I was really psyched to see these V2’s already. Amazing looking. 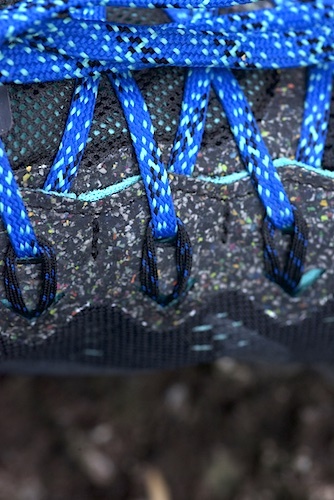 These trail shoes appear to be built from quality materials. The cushioning seems just right. The grip on the bottom looks well thought out with the exception of the heel where I think some improvement The design was awesome. I have had three different people (all non-runners) comment on these shoes, and they’re going out to try a pair on in their size to see if they can wear them too. Yeah, they’re that cool looking. Apparently, I don’t know what cool is because I thought the light blue Nike Swoosh on the side didn’t go with the blue shoelaces. What do I know? Apparently, people love the look. I honestly liked the grey pair better, but they didn’t have my size. I have yet to see anyone at the park, the mountain, or at races wearing these same shoes. I think it is probably the price. Honestly though, after having them for about three weeks, I’m going to order another pair if I cannot find them at this store when I return in a couple weeks. How Is the Terra Kiger V2 for High Arches? Wide Toe-box? I have high arches and need a wide toe-box. I was really pleasantly surprised when, after lacing up both shoes and standing up – they fit! This is a rare occurrence with me and shoes of any sort, especially running shoes. Especially NIKE running shoes, which have always run thin in the toe-box area. With the New Balance Minimus, I wore the 10.5 USA size EE. The Nike Terra Kiger v2’s come in just one width. A couple of other reviewers and commenters were saying they didn’t like the shallow (in height) toe-box. I don’t really get it, it gave me no trouble whatsoever. I have no problem with them, but I feel the shoe slightly in the toe-box. The feeling is NOTHING like the old Nike Air Socks that I used to buy, that were snug as a bear in a rug. Or something like that. They squeezed my foot, and were elastic, and I got used to it because I loved that sockless fit so much. The Terra Kiger 2’s are not elastic at all and yet I think the toe-box has the perfect height. Can the Terra Kiger V2 Be Worn Sockless? Many of you are probably wondering, can you wear these shoes sockless? I don’t think I could. I mean, I could. I don’t think I’m going to like wearing them sockless, though I wear them sockless all day around the house to give my foot some support and cushioning as I heal up. There is a slippery nylon (I assume) liner in the shoe that takes away the feeling of any rough seams. The inside of the shoe feels very smooth, very comfortable. The one thing that would irk me going sockless is that the outsole of the shoe is not flexible enough to bend with my feet. When I run, and even slow, I notice my heel coming out of the back of the shoe too much. If I wasn’t wearing socks, I’d likely have blisters for a while. I don’t want blisters for a while! I’ve got enough problems lately. Maybe in the future after a couple hundred kilometers the shoes will flex more and I’ll consider going sockless. At the moment I’m really happy with wearing a thin, light sock like the Nike Dry-Fit. This is what I’ve done most lately because my foot still hurts occasionally after a run. With walking, they’re great. I think I could walk 30-miles in these shoes without a problem. They are that comfortable, and the fact that they aren’t so bendy – means they’ll save my feet some on long hikes through the rainforest. The Kiger v2 has been updated with a single density midsole throughout and feels firm and confidence inspiring. I’ve run on the grass and dirt at the park near our house about half-a-dozen times now. This is a flat park without any vertical. There are a couple different surfaces, loose gravel, loose dirt, hard-packed clay, grass, and asphalt. The shoes shine on all these surfaces when running slow and on the flat. In comparison to the Nike Free 7.0 v2’s or the Minimus mentioned earlier, I like would choose the Nike Free’s for the park if running fast or slow for a short distance. I’d choose the Zoom’s for anything over eight or nine miles because they’d save my feet some pounding. On the hard flat, I really do like the Nike Free’s soft cushioning. Because I’m a gimp at the moment I cannot give a first-hand account here. I can tell you that a pro said he wears these shoes for 4-5 minute miles on the trail and he loves them. With all the heel slippage in mine, I don’t think I’m going to give the same glowing review, but I’ll keep an open mind. I’ll update this article as I’m able to put the shoes through some fast (6-minute mile!) runs. Fast for me anyway. Are the Terra Kiger V2’s Great for Stair Climbing? I’ve climbed the 1,256 steps up the mountain (280 meters elevation) about fifteen times with the Zooms so far. I absolutely love them for stair climbing. The stairs are concrete, but the fact that my feet flex so little during the climb these would be my go-to shoes for all future climbs up the stairs. Coming down the stairs fast, they give just the right amount of cushion and non-flex to keep me moving smoothly and quickly. Now, granted, I haven’t run hard in these yet, and we are in the dry season which means temperatures are in the 80’s instead of 90-100F, but still my feet have yet to sweat in these shoes after about 18 workouts. What’s really an eye-opener is that when I ride the motorcycle I feel more air coming through these shoes and hitting my feet than I do with either the Nike Free’s or the New Balance Minimus. MUCH more air. So, the ventilation is bordering on the best I’ve ever felt in a running shoe. Definitely the best in the past ten years. Construction – the following three sub-headings came from Nike’s Press Release. 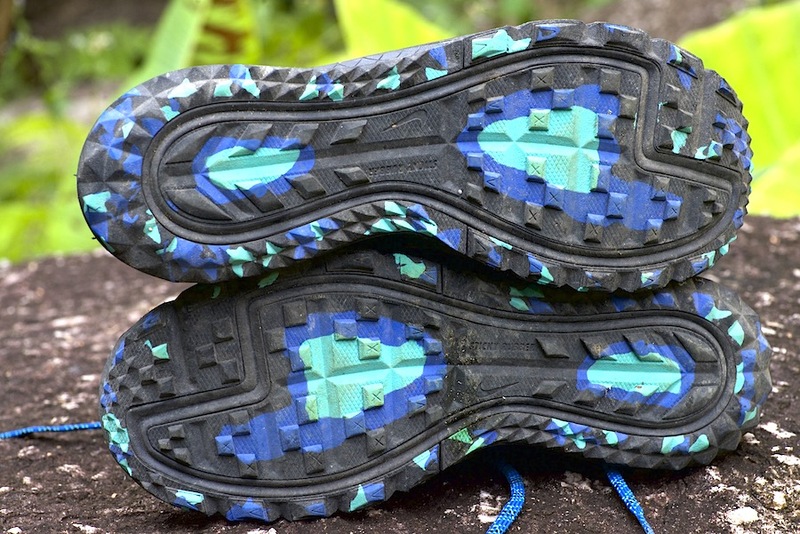 Multi-Directional Lugs provide increased traction on trails. EVA sock liner mimics the curvature of the heel and arch for increased comfort and support. Built stronger than the Nike Free or Minimus. 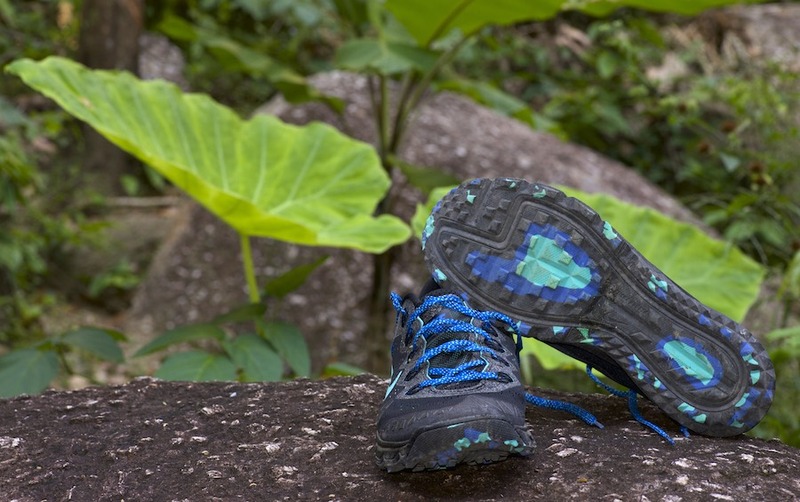 Strong rather inflexible sole – good for some environments. Good foot protection from sharp rocks and maybe thorns. Much more than Free or Minimus. Solid and grippy rubber sole – beats the pants off the other two shoes I keep comparing them to. Airy and very cool. Great for hot weather. Perfect grip for dirt, hard-packed or loose. Heel pulls out of shoe some during foot flexion. Maybe I could have worn a 1/2-size smaller, but then I might be complaining about the toe-box. The outsole is stiff. I think I’d prefer it a bit more flexible, but I love the cushioning and rubber sole. Some are complaining about the shallow toe-box. You can remove the insole or wear thin or no socks and that should resolve any issues. Type: Trail running, specifically good for technical trail with dirt, sand, smooth rocks & roots. Wet or dry. Not so great for concrete. Construction: Rubber and regrind outsoles; Redesigned (harder) mid-sole; Single-layer engineered mesh on the toe box delivers lightweight breathability and comfort. 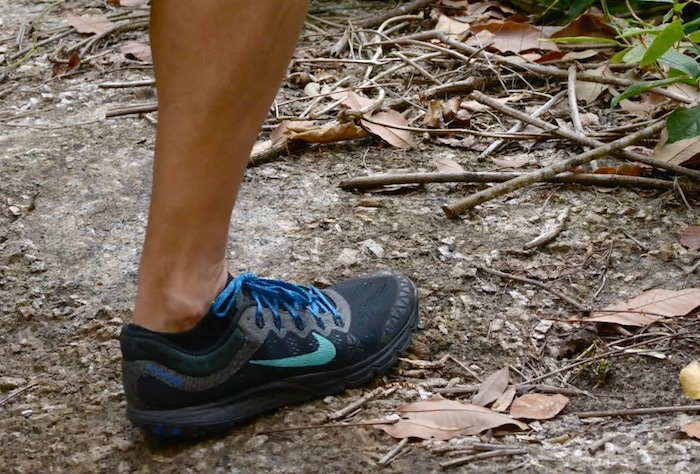 Vertical Heel Drop: 4mm from heel to forefoot – same as the Minimus. 2018 Price: Around $125, plus shipping if sent overseas. Any PROS wearing the Nike Zoom Terra Kiger v2’s? What are you waiting for? Go get yours! UPDATE 2/14/2018 – the new Terra Kiger 3 and 4 trail running shoes are out! Click here to see ’em.